The Camargue is the extensive marshland that is formed by the Rhone delta as it debouches into the Mediterranean.They are beautiful and remarkably unspoilt wetlands that have their own black longhorned cattle and their own species of cowboys who round them up on their white Camargue horses that seem to thrive in this land of creeks, reeds and marginal grass. The cowboys are more like gauchos - tough, wiry and unshaven - and a long way from Marlboro Man. 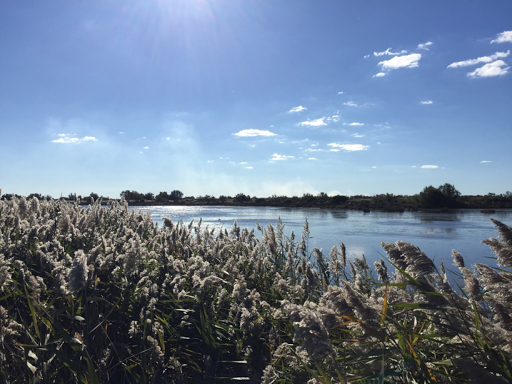 On the edge of the Camargue is Aiges Mortes (which is Occitan meaning 'stagnant water). This is is a walled city from which Louis IX set off for his Crusade in 1240 and has not changed much (from the outside) since. 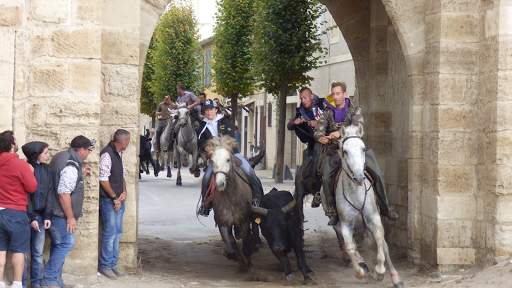 Every year they run their Camargue bulls through the streets but, unlike those in Pampalona, these bulls are not free-running en masse but individually corralled by three cowboys on their white horses, two riding either side of the bull and one behind with a long pole topped by what looks like a small shepherd's crock. How they use this I have no idea. They leave a temporary arena outside the walls and gallop flat out through the middle of the city with a couple of right angled turns in and out of the city. Anyone who is thinking of running the bulls at Pamplona - think again. They are incredibly fast and even Usain Bolt wouldn't stand a chance. This doesn't stop teenage boys casually standing in the middle of the road as the bull and its posse exit the city and, as they pass, sprinting into the maelstrom of hoves to grab the horns and bring the bulls down onto the sand that is covering the road. We were standing close by and their courage and agility in doing this was something to see. Are you paying over $5 / pack of cigarettes? I buy my cigarettes over at Duty Free Depot and this saves me over 60%.